More recently, Senator Durbin's office seems to be doing everything it can to avoid telling the truth about his relationship with Spizzirri and her Chicago-area nonprofit that's now under investigation by the Illinois Attorney General and apparently by at least one federal agency. In the interests of obtaining more information, I have an idea for an interesting, perhaps even fun, experiment. Earlier this month I reported that the senator's press secretary, Christina Mulka, provided a variety of false information to a Texas blogger about her boss's relationship with the Save-A-Life Foundation, a Chicago-area nonprofit now under investigation by the Illinois Attorney General. According to this February 17, 2011 Huffington Post article by Will Guzzardi, SALF claimed former president of the Chicago Board of Education Gery Chico was on the board of their organization, but Mr. Chico denied the claim. Two days later I provided the information in Mr. Guzzardi's article to the CTB (the Illinois Attorney General's Charitaible Trust Bureau) in this letter. 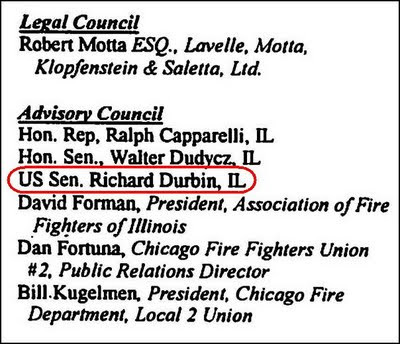 Similarly, I'm trying to determine if the two claims published by SALF about Senator Durbin that I brought to your attention - that in year 2000 he was a member of SALF's Advisory Council and/or was Honorary Chairman of SALF's Annual Dinner Dance fund raising event - are accurate or not. Your answers could assist the CTB in their efforts to determine whether any irregularities have occurred. No response to that either. According to Maura Possley, the deputy press secretary for the Illinois Attorney General's Office, a nonprofit misrepresenting the makeup of its board of directors in an annual report would be perjury, a Class 3 felony. Color me naive, but shouldn't a US senator want to assist an investigation by his home state? But it's more than a lack of co-operation in this case. Based on numerous inquiries I and others have sent to his office, Sen. Durbin doesn't seem interested in finding out if the nearly nine million in Illinois and federal tax dollars awarded to SALF did, in fact, provide in-class first aid training to "2 million children...many of them from the Chicago Public Schools" which is what SALF founder/president Carol Spizzirri told the Tribune a couple years ago. Color me skeptical, but since the Chicago Schools apparently have no training records, isn't that claim iffy? A generation of students supposedly participated in the program, but there are no records? As for Sen. Durbin's ten-year relationship with SALF, his press secretary may not be intentionally engaging in misdirection, but she's doing a boffo job of creating that impression. (He) never worked to appropriated (sic) funding for the organization. If you're the type who prefers to let sleeping dogs lie or doesn't care what happened to the millions of tax dollars awarded to SALF, no need read any further. However, if you're not that type and may be up for a little experiment in participatory journalism, here's what I've got in mind. Since Sen. Durbin won't answer me, maybe he'll answer a constituent. 1) Were you ever a member of the Save-A-Life Foundation's Advisory Council? If so, during what years? 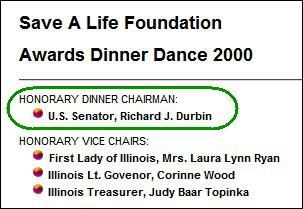 2) Did you serve as the Honorary Chairman of the Save-A-Life Foundation's Annual Dinner Dance in year 2000? Click here to e-mail him via Ms. Mulka or send it via the Senator's website. Feel free to courtesy-copy me on your inquiry and let me know the response. I'll publish the results (or non-results) in a future item. Click here for my e-mail address. Am I asking readers to do my work for me? You betcha. But only because I hit the stonewall. I'm also interested in learning what happens with this message in a bottle I'm sending into cyberspace. I've never done anything like this and I don't know if any other blogger or reporter has. Will it generate newsworthy results or bupkis? Dunno, but that uncertainty is one reason why I think it's fun and worth a try. Also, don't all good citizens share the belief that our elected officials should be accountable? Here's a painless opportunity to see what happens when you try with one of the our nation's most prominent public servants. Illinois, the ball's in your court.